Home / Editor's Choice / WETANGULA claims that he was the target of an assassination attempt on Monday – I dodged bullets like Rambo!! WETANGULA claims that he was the target of an assassination attempt on Monday – I dodged bullets like Rambo!! 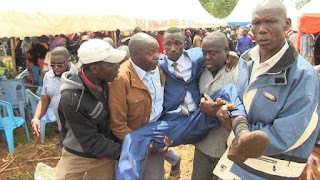 Wednesday August 22, 2018 - Bungoma Senator, Moses Wetangula, has claimed that he was the target of an assassination attempt on Monday during the funeral of Likuyani MP, Enoch Kibuguchy’s driver in Trans Nzoia. Addressing the Press after the shootout where 4 people were injured, Wetangula who is also Ford Kenya party leader said the incident at Mukuyu village in Kiminini was a political elimination targeted against Ford Kenya’s leadership. “I am perturbed that the bullet was meant for me,” Wetangula said. The sentiments were supported by Kapomboi MCA, Ben Wanjala, who sustained bullet injury during the fracas. “The bullet which shot me was meant for Mr Wetang'ula, it missed him by a whisker,” said Mr Wanjala who is receiving treatment at Mt Elgon Hospital in Kitale.